Don’t neglect the rhomboids – you’ll regret it if you do! Currently, I’m having difficulty finding that I’m constantly raising up my right shoulder, and this is partially as I have been concentrating on my elbow fracture rehabilitation and not also doing sufficient of the the shoulder exercises when doing my physiotherapy. Rather embarrassing as I was warned about this! When starting to move the arm again, look to mimic the movement of your good arm. Especially the position of the shoulder. This is something I wish I had done from early on in the rehabilitation, as it may have reduced the discomfort I have to the right shoulder now. Ice is NOT used to reduce the inflammation in an injury or joint. It is used to help pain relief. However don’t put the bare skin straight onto ice, or onto a ice gel pack – ensure that the ice/cold block is inside something. Even if this means wrapping the ice in a tea towel. By doing this, you are still able to get the benefit of the cold being applied to your injury, but you won’t freeze/stick yourself to the ice pack!! LISTEN to your physio team during fracture rehabilitation. I know that sounds daft, but sometimes the information can be counter intuitive when you want to get moving again. When I was advised to start pool physiotherapy, I gave it a go. 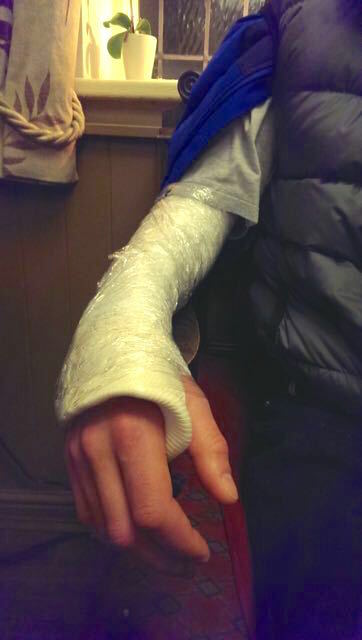 The arm hurt, at the olecranon fracture site continuously for about a week afterwards. The physiotherapist advised to stop anything other than merely the stretches for another 10 days. This is REALLY difficult, as I wanted to get back to a normal life. However the pain did subside. The converse here, I’ve now been advised to start LOW LEVEL – 0.5kg weight training, but at this stage of healing, well into the 6th week post op, I have been told that pain 5/10 is safe. That makes it REALLY painful but inside the elbow, not at the olecranon fracture site. However shocking the pain drops off over a period of days. Its feels like you are breaking scar tissue, or something, but in a good way. 3 days since I was told its safe to start putting power on it, every day I’m finding the pain gets less, and that I can move further! !